Long have I awaited this movie coming out. I’m a HUGE Bond fan. I think Craig is the best Bond ever and I will write another article explaining that. This wasn’t the best Bond movie. I was actually alittle disappointed with the way this movie progressed. First, a spoiler. 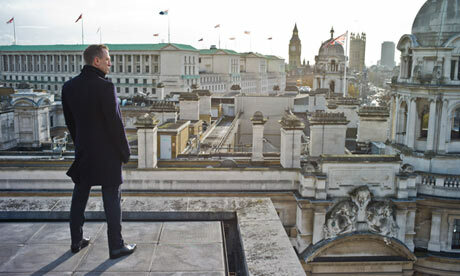 Skyfall? What is it? The answer to that reminded me of a Family Guy clip. That’s kind of what Skyfall means. The plot is very simple and the main villain, Silva, has a main goal that in the end confuses me. Without giving away too much, his plan is to kill M. So this man spent the bulk of many years becoming the head of a criminal empire and his main goal is killing a woman who let him out to die. In the new Batman movie, I was upset that Bane’s master plan was blowing up Gotham. I was mad because he became a suicide bomber, rather than just blowing it up and staying alive to inflict more chaos upon the world. Silva eventually has a plan like that. Not saying he blows himself up, in the end he doesn’t kill himself, but something similar to that happens. The action was intense from beginning to end. The comedy is what made the movie even better. It kind of reverted back to the old one liner Bond days. Where everything Bond says is funny. 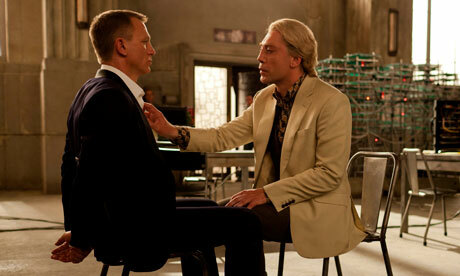 In one almost shocking scene, Bond is strapped to a chair with Silva in front of him. Silva, who I think is gay, starts rubbing Bond’s legs and says “This is probably your first time” Bond looks at him and says “Who says this is my first time?” and Silva almost faints after hearing that. The ending was the only problem. It was really dark. And a lot of it didn’t make sense. The guy wanted to kill M, so why just Bond and M go to a house in the middle of nowhere waiting for Silva? A lot didn’t make sense. What annoyed me was that Silva was smarter than everyone! Even the new Q. Silva’s plan was too perfectly executed. Even though it sounds like I didn’t enjoy it, I still would see it again. A 4/5 and a must see for Bond fans.